Gorbachev’s Gamble offers a new and more convincing answer to this question by providing the missing link between the internal and external aspects of Gorbachev’s perestroika. Andrei Grachev shows that the radical transformation of Soviet foreign policy during the Gorbachev years was an integral part of an ambitious project of internal democratic reform and of the historic opening of Soviet society to the outside world. Grachev explains the motives and the intentions of the initiators of this project and describes their hopes and their illusions. He recounts the story of the internal debates and struggles in the Kremlin and behind-the-scene decisions that led to the Soviet withdrawal from Afghanistan, the fall of the Berlin Wall, the break-up of the Warsaw Pact and eventually the demise of the Soviet Union itself. The book is based on exclusive interviews with the leaders of the Soviet Union including Gorbachev, personal notes and diaries of their assistants and advisers and transcripts of the discussions inside the Politburo and Secretariat of the Central Committee. Together they constitute a multi-voice political confession of a whole generation of decision-makers of the Soviet Union that enables us better to understand the origin and the breathtaking trajectory of the events that led to the end of the Cold War and the unprecedented transformation of world politics in the closing decades of the 20th century. Andrei Grachev was former political adviser and last official spokesman of Mikhail Gorbachev. "A major contribution to our understanding of the last years of the Soviet Union and to the end of the Cold War." "The stand-off between Russia and the west over military intervention in Georgia in 2008 raised the spectre of a new cold war between the world's military and economic powers. The timing of Andrei Grachev's book on the events that led to the end of the old Cold War, therefore, could not be better. 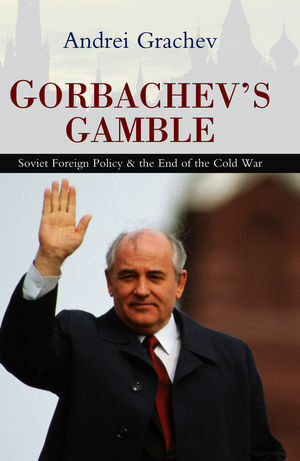 Gorbachev's Gamble is a sympathetic and detailed analysis of how the last Soviet leader's 'new political thinking' brought about the break-up of the Warsaw Pact and of the Soviet Union itself in 1991." "This gripping book is one that deserves the attention of students of politics, international relations and history." "The ultimate, definitive and conclusive account of one of the most transformative periods in modern history. As we continue to be shaped by the consequences of the critical years examined by Grachev, we shall continue to learn from this masterful book." "Andrei Grachev, an important member of Gorbachev’s foreign policy team, writes as a participant-observer. His penetrating and well-informed account of the end of the Cold War, as seen from the Soviet side, offers a subtle and persuasive interpretation which will be a valuable corrective to much Western conventional wisdom."